Source: Tanaka Holdings Co., Ltd.
TOKYO, Feb 8, 2018 - (ACN Newswire) - TANAKA HOLDINGS Co., Ltd. (Head office: Chiyoda-ku, Tokyo; Representative Director and CEO: Akira Tanae) will produce and donate gold, silver, and bronze medals to the top three men and women finishers of the marathon and wheelchair marathon events of the Tokyo Marathon 2018 (a total of 12 medals). The Tokyo Marathon 2018, organized by the Tokyo Marathon Foundation, will be held on February 25, 2018. The wheelchair marathon has been officially sanctioned as an international event since 2016. The medals to be presented to the marathon winners are approximately 65 mm in diameter and 3 mm thick. The pure gold medal weighs approximately 200 grams, the pure silver medal 110 grams, and the pure bronze medal 90 grams. TANAKA is also holding a Tokyo Marathon Winner and Finisher Medal Exhibition at its GINZA TANAKA main store in Ginza, Tokyo, from February 2 to 12, 2018. TANAKA HOLDINGS is actively supporting the Tokyo Marathon 2018 with the provision of medals recognizing the efforts of the marathon runners and by holding this exhibition. The Tokyo Marathon medals provided by TANAKA HOLDINGS are made from pure gold, silver, and bronze, which are extremely rare even among medals presented at sports competitions. They are rarities of considerable value. The medals for the Tokyo Marathon 2018, the 12th Tokyo Marathon, were designed with the "RUN as ONE" event concept as their theme. The overlapping lines represent the runners who compete in the Tokyo Marathon as well as the volunteers who support the event and the spectators who encourage the runners. The lines portray the varied routes (courses) of the many people involved in the Tokyo Marathon, and express their commitment to move forward. The design expresses the 42.195 km of the Tokyo Marathon being created by the interactions of people as a tapestry made of interwoven lines (threads). The circular hole in the center of the medal expresses harmony and signifies looking ahead to the future. The overall round form and hole were designed to convey a hope for a bright future created through the connections between people, seen from the hole (a circle). 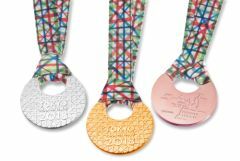 The reverse sides of the gold, silver and bronze medals that will be presented to the top three winners of each marathon event depict the new course map and the TANAKA KIKINZOKU logo. The Tokyo Marathon Winner and Finisher Medal Exhibition, to be held at the GINZA TANAKA main store in Ginza, will display the 2018 winner medals as well as replicas of previous winner medals and all finisher medals that the TANAKA KIKINZOKU Group has been involved in producing since 2007. Photo panels of athletes who competed in earlier Tokyo Marathons will also be on display. The TANAKA KIKINZOKU Group has produced the winner medals and finisher medals for every Tokyo Marathon since the first was held in 2007. The Tokyo Marathon was added to the World Marathon Majors (currently the Abbott World Marathon Majors) in 2013, attracting global attention as one of the world's six premier marathons. The TANAKA KIKINZOKU Group has produced and sold various commemorative medals other than for the Tokyo Marathon, including the official commemorative medals for the 1964 Tokyo Olympic Games. 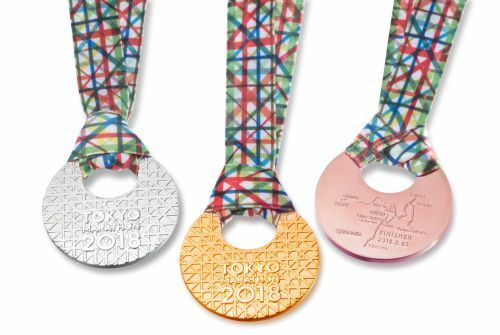 The TANAKA KIKINZOKU Group will continue to produce medals made of precious metals and support various events in a way unique to the Group. The winner medals (gold, silver, and bronze) will be displayed according to the following schedule. Since its foundation in 1885, the Tanaka Precious Metals group has built a diversified range of business activities focused on precious metals. Tanaka is a leader in Japan in terms of the volumes of precious metals handled. Over the course of many years, Tanaka Precious Metals has not only manufactured and sold precious metal products for industry, but also provided precious metals in such forms as jewelry and resources. As precious metals specialists, all Group companies within and outside Japan work together with unified cooperation between manufacturing, sales, and technological aspects to offer products and services. In addition, in order to make further progress in globalization, Tanaka Kikinzoku Kogyo welcomed Metalor Technologies International SA as a member of the Group in 2016. As precious metal professionals, Tanaka Precious Metals will continue to contribute to the development of an enriching and prosperous society. The TANAKA KIKINZOKU Group is cooperating with the Tokyo Marathon.